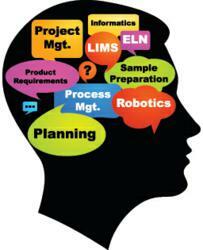 Courses help lab professionals apply automation knowledge. Most courses in laboratory automation focus on training for specific technologies and applications. Our approach is quite different. We provide unbiased, vendo-neutral education on how to plan and implement lab automation systems. Laboratory managers and other lab professionals who are looking to automate their labs will soon have a chance to make that process a little easier. Starting in April, Lab Automation University (LAU) Online will be running a series of webinars titled “Managing Lab Automation” in order to provide lab professionals with the basis for understanding and applying laboratory automation technologies to their work. Unlike programs that stress specific individual technologies, the LAU’s unique program is designed to give those responsible for lab automation programs the background needed to understand how all the pieces – including products, technologies, planning, people, etc. – can be brought together to achieve the goals they’ve set for improving their labs’ operations. The purpose of the program is to give lab professionals the tools they need to make informed choices and be successful in an increasingly demanding environment with both technical and workforce challenges. The series begins April 3 with a session focusing on what lab automation is and why it is important and continues with the first part of a session on “Options for Improving Productivity & Technologies in Lab Automation” on April 17. Part two of that webinar takes place May 1 with a focus on considerations in purchasing informatics products. The fourth and final webinar of the series wraps up on May 8, teaching registrants about management’s role in lab automation and issues in automation. Individual sessions cost $99 USD each while the entire series is $360 USD. The Institute for Laboratory Automation and Lab Manager Magazine have partnered together to create "Lab Automation University ℠" – a series of web-based training events to teach lab managers, lab personnel and support teams, how to plan for, purchase, and utilize lab automation products and technologies.